Readers are treated to a memory-filled stroll down Main Street during Buffalo's halcyon days. As a new century was ushered in, Buffalo basked in the early 1900s glow of being a thriving transportation mecca, a center for commerce and a magnet for immigrants who built new lives for their families. 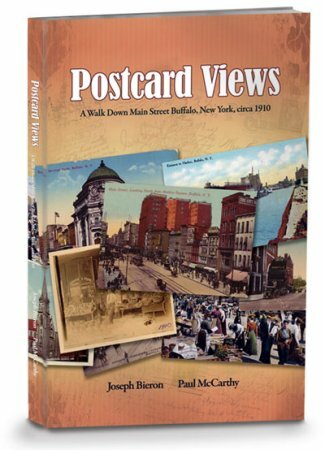 Joseph Bieron and Paul J. McCarthy have compiled a fascinating tome that uses full-color postcard scenes to depict historically-accurate glimpses of Main Street in the early 1900s. Scenes capture the hustle-and-bustle of Lafayette Square, Shelton Square, the Shopping District and many other iconic spots. Visit the Chippewa Market, the Hotel Statler, Buffalo's thriving waterfront and numerous downtown churches. The book includes maps, a postcard index and break-out boxes that showcase specific milestones in Buffalo's history.